Would you ever imagine that Charleston’s most famous and scenic drives was actually built upon a line of driven piles that were up to seventy feet long? Yep, this must-see for tourists was constructed nearly a hundred years ago over a sea wall built to hold nearly 700,000 cubic yards of sand and silt that had been pumped in from the Ashley River. It’s true: 43 acres of mud flats that were once an ‘eyesore’ at low tide were transformed by some of Charleston’s original visionaries into one of its most desirable neighborhoods and famous vistas. Probably this project more than any other served to mark the beginnings of a progressive Charleston. But it wasn’t easy. Last week, we mentioned that one of the major achievements of Mayor R. Goodwin Rhett was the commencement of building “The Boulevard” in 1909. “For more than half a century,” he said, “it has been the dream of our people to extend the Battery westward. The dream, in fuller measure than ever pictured, is now becoming a reality.” The reclamation and development of the low marshes of the Ashley River on the “West End” of Charleston was a project originated by C. Bissell Jenkins and championed by philanthropist Andrew Buist Murray--for whom the Boulevard was later named. From 1909-1922, thousands of city taxpayer’s dollars were spent on the project, which was accomplished in four phases: reclaiming the land, building a seawall, constructing the roadway, and building infrastructure: drainage, sewage, and permanent paving. The work spanned the offices of three mayors, all of whom supported the project: Mayors Rhett, Grace, and Hyde. During construction, Charlestonians had mixed views of the project. 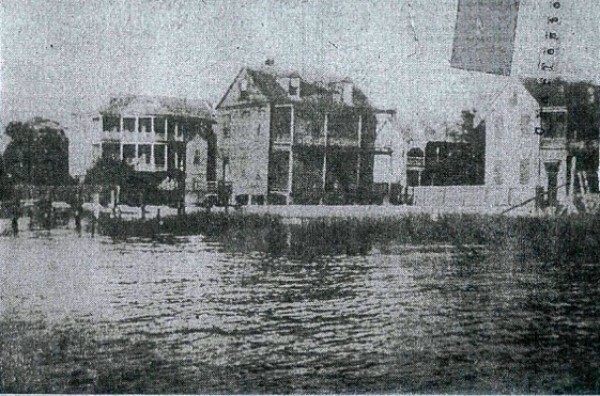 The shoreline of the Ashley River at Gibbes Street prior to 1909. The Parker-Drayton House (circa 1806) at 6 Gibbes can be seen in the back, and the old Lesesne House at 11 Gibbes can be seen in the fore. Charleston Evening Post, 1938. 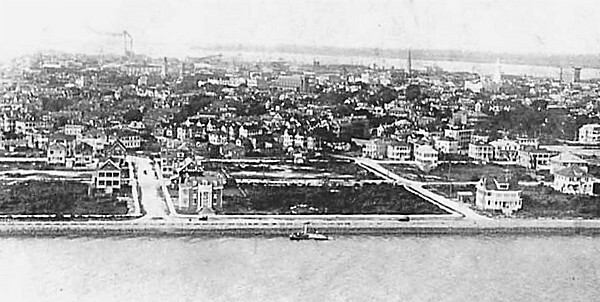 Before the reclamation and building of the Boulevard, the Ashley River lapped two blocked behind it at Gibbes Street, as seen above. A December 2, 1938 Evening Post article describes 11 Gibbes Street, in the center of the photo, as the headquarters for the “Old Gibbes street gang” of boys, which existed during the time of the Downtown Gang, the Uptown Gang, and the East Bay Gang. What on earth were all of these gangs up to? Well, evidently the Gibbes Street Gang--whose numbers rose to 40 at one point--“hung out” under the house and carved their names into the rafters and went swimming and sailing in front of the house. Sounds like the aces, don’t it? Hope those boys weren’t too upset when the reclamation started! 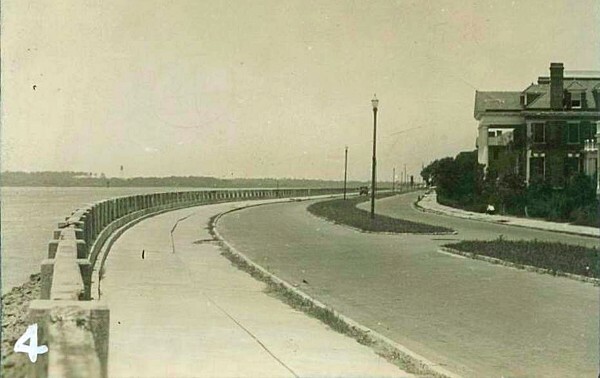 The first phase of the Boulevard Project began in June, 1909. First, a retaining wall was constructed that extended from the southern end of King Street along the Ashley to Chisolm Mill, at the western end of Tradd Street. 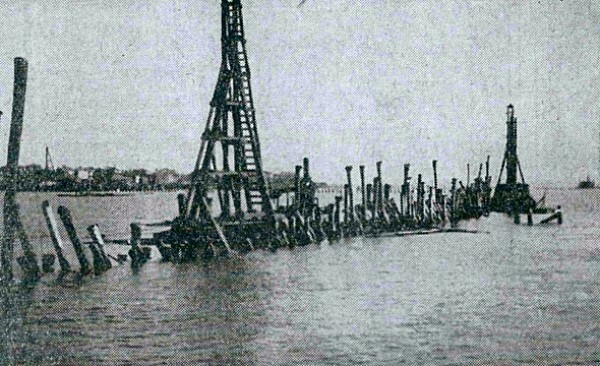 Wooden pilings 30-70 feet long were driven into the mud to support the foundation of the concrete sea wall. Concrete was poured along the 3,885 ft. total length of the sea wall and cobble stones, oyster shells, and granite rubble was laid at the toe of the wall to strengthen it. Next, a total of 667,000 cubic yards of material was pumped in by dredges to bring the area up to 8.5 feet above mean low tide. The contractors had to add more fill material to raise the elevation after settlement and shrinkage. At the end of 1911, 47 acres had been reclaimed and was divided into 191 residential building lots. The Ashley River Water Front Corporation was created to oversee all new construction and to manage the lot sales. This was the time to buy waterfront property in Charleston, that’s for sure! During the second phase of the project, most of the reclaimed area lay idle as infrastructure was incomplete. Still, lots were sold and construction began on some homes as early as 1912. By 1917, sewerage and drainage systems were extended into the “West End” as it was now called, and oyster shell roads and concrete sidewalks were constructed. Also in 1917, the extension of the sea wall eastward to connect with the East Battery was begun. 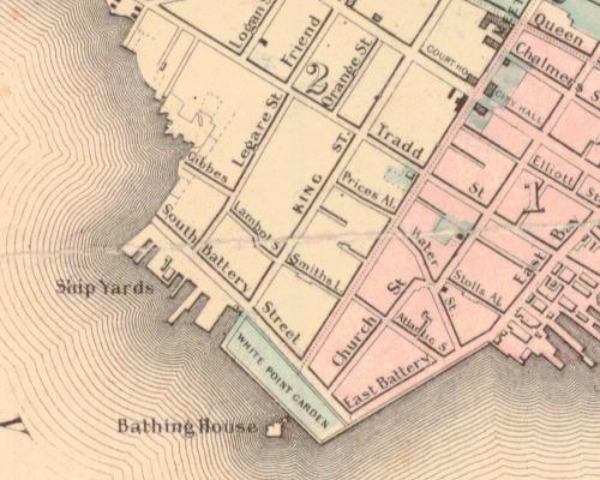 Three years later, the two were connected, creating a unified waterfront drive from the East Battery to the west end of Tradd Street. In 1922, a cinder roadway was constructed, as the ground was still settling too much for a permanent road. 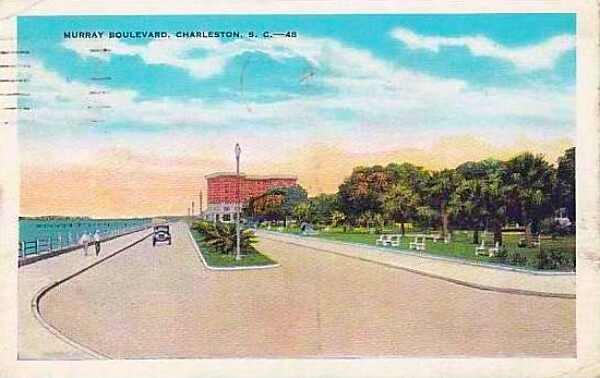 In 1926, the Boulevard was permanently paved and Mayor Rhett’s dream of a “great Palmetto avenue” was finally realized. The noted landscape architect Loutrel Briggs designed the beds to be installed between the two one-way roads. It is said that current mayor, Thomas P. Stoney, insisted there be no parking on the Boulevard--it would be too ugly. We see your point! Mayor Rhett envisioned “a residential district, second to none in Charleston” in this project, and if only he could see it now. One of the reasons the peninsula’s ‘newest’ neighborhood has become one of its most desirable waterfront residential districts is because all titles to the building lots in the area were subject to specific ordinances. For example, lots facing the riverfront drive had to be at least 57 feet wide and 130 feet deep; they could not be subdivided to less than 45 frontage feet and could only contain one residential structure. In addition, a 12 foot setback requirement was enforced to retain the openness of the waterfront location and no commercial or industrial structures were permitted near the Boulevard/South Battery area. Most of the original 191 lots have been developed over the last hundred years, resulting in a variety of architectural styles including Colonial Revival, Beaux Arts, Georgian Revival, Federal and Neoclassical Revival. Many of these homes are considered some of the most picturesque on the peninsula, and their surroundings of open gardens and wide roads and sidewalks gives them a distinct feel in a city that was built for horse and carriages. 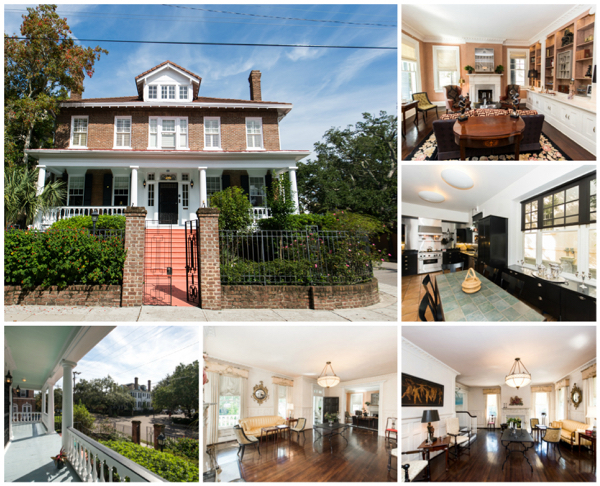 Lois just listed one such home at 96 South Battery. Built as one of the first in the new neighborhood in 1918, it originally had an unblocked river view and you can still smell the saltwater and feel the seabreeze at this gorgeous home. Please call Lois at 843-270-2797 to schedule a showing! This two story brick residence is located one block off Murray Boulevard and only three blocks from White Point Gardens. The interior features beautiful neoclassical elements and graciously sized rooms. The living room has original high wainscoting and an Adamesque mantled fireplace. A cozy library off the living room has built-in bookshelves and a fireplace. The dining room, also with high wainscoting, features a mural based on an 18th century Italian landscape. There is a butler’s pantry and eat-in kitchen. The second floor is comprised of four bedrooms and two bathrooms. There is a rear staircase leading to the third floor which can be converted to additional living space. The deck can be removed to create a large garden. Working elevator. Four bedrooms, two and a half baths, 3,642 square feet.